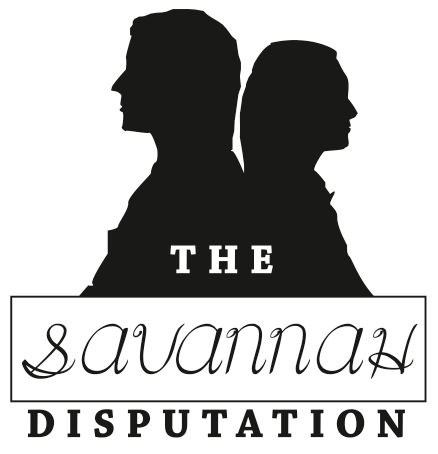 Click Here to purchase tickets for The Savannah Disputation! Thanks to everyone who came out to see The Savannah Disputation! See our next show Caroline or Change this November! Two elderly sisters forget all about southern charm when a young door‐to‐door evangelist comes knocking. This theological comedy blends Smith’s trademark sharpness of wit and depth of character, while telling a story in which a crisis of faith arises when seemingly similar beliefs are discovered to be worlds apart. The subject is damnation, yet “The Savannah Disputation” is as light as the iced tea served by the comedy’s odd‐couple sisters in their staid Southern home. A minor‐sect evangelical Christian ‐‐ a perky blonde, no less ‐‐ has come a‐knocking to save the souls of these two aging gals, Catholic heathens that they are. Mary, the tart‐tongued sister, wants the missionary out. Margaret, the kind but dimmer sibling, is just addled enough that she wants to hear more about the alleged fallacies lurking within Catholic doctrine. (Melissa, who in another scenario might make a plausible cable‐news host, has shocking “facts” up her sleeve and colorful pamphlets to back her up.) Before you know it, Mary has roped the handsome, vaguely lonesome Father Murphy into the picture, and everyone’s flipping through various editions of the Bible to nail down arguments with chapter and verse. One of the strongest messages is how important it is for us to discuss our beliefs with each other, especially when those beliefs bring out differences between people, especially the religious differences. We don’t discuss these things enough with each other. And the lack of discussion is one thing that deepens the separation between people; a lack of understanding and knowledge about others beliefs that fosters continued intolerance of people who don’t agree with our views or experiences. The desperate need for us to love people and accept people in spite of our differences is a big theme in this story driven and expressed from a rich and well written dialogue expressing how sometimes we are much closer in beliefs than we initially think while at the same time the differences between beliefs can often times be exaggerated and become insurmountable obstacles. It’s an invaluable lesson for us to hear: no matter what we differ in view or creed, the most important thing is to continue the discussion; to continue the relationship. This story is an exploration of the experience of people when they come to details and beliefs they disagree on. Certainly puts into perspective the challenge of sharing your faith with people who you know don’t believe the same way. This play is about witnessing, but it doesn’t have the appeal one would think “give your heart to Christ.” It communicates the challenge and need to keep the conversation going, “keep talking”, and puts the importance of our relationships front and center, even making them more important than beliefs, where debate is concerned. One mission of the theater is to get the audience to start asking the questions, more even than providing all the answers. The play tells a story that will cause the audience to leave, having watched the play, and really ask questions about their own experience. This play does that throughout, without creating a threatening environment, or pressuring appeal.